HARTFORD - With another hurricane season already under way in the Caribbean, U.S. Rep. John Larson joined Central Connecticut State University President Zulma Toro and other community leaders at Pope Park Monday to discuss Puerto Rico’s ongoing recovery from Hurricane Maria. Maria devastated Puerto Rico in September 2017, killing dozens by conservative estimates - a report published in the New England Journal of Medicine earlier this year said 4,645 people may have died during the storm and its aftermath. According to the Associated Press, some 60,000 people in Puerto Rico still have only tarps for roofs blown off by Hurricane Maria, and more than 1,500 customers are still without power nine months after the storm. The hurricane caused more than an estimated $100 billion in damage and destroyed up to 75 percent of electricity transmission lines. “It was nine months ago that this devastation occurred, and still people are in need,” said Larson, a Democrat representing Connecticut’s 1st Congressional District. Larson said it’s important that legislators continue to advocate for support for the U.S. territory as another hurricane season begins. According to the AP, Puerto Rico braced for heavy rains and strong winds Monday after Tropical Storm Beryl, the first major storm of the reason, dissipated after passing Dominica. The U.S. National Hurricane Center said the remnants of the storm could bring 2 to 3 inches of rain to Puerto Rico, potentially causing flooding and landslides. The National Weather Service issued a warning that heavy showers and winds of more than 50 mph were approaching the island’s east coast Monday morning. The storm’s center was expected to pass just south of the island. Outages associated with the rainfall from Tropical Storm Beryl were already reported across Puerto Rico early Monday as Gov. Ricardo Rossello urged people without sturdy roofs to move in with relatives or go to one of 14 government shelters that have opened. Toro, who is Puerto Rican, said she wrote a letter the Connecticut’s Congressional delegation last year shortly after Hurricane Maria hit the island so see what could be done to help. “I was writing that letter not as the president of Central Connecticut State University - I was writing that letter as a Puerto Rican with lots of family and friends on the island,” Toro said. Since last year, Toro and CCSU have helped New Britain’s school district take in more than 200 relocated students from Puerto Rico through partnerships. Along with the school district, CCSU established a welcoming center for students and their families. The university, in conjunction with the Connecticut State Colleges and Universities system, also began a program to help college students from Puerto Rico finish their schooling at CSCU while paying in-state tuition and receiving financial aid. “I am happily pleased to inform that two of those students did complete their degrees with us ... as part of the outreach program we are going to get an additional 14 students this coming fall,” Toro said. 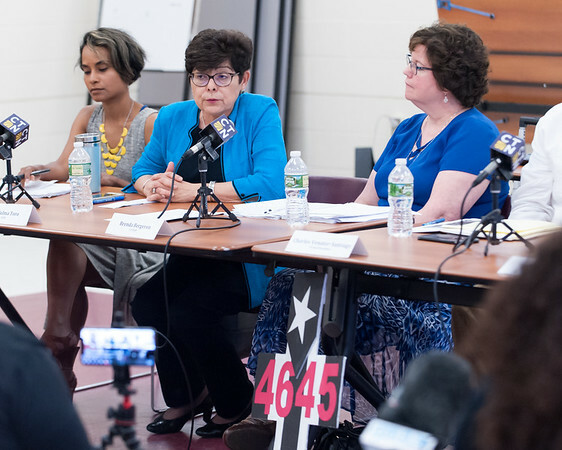 Speaking from another local perspective, Hartford City Councilwoman Wildaliz Bermudez said there are many ways the federal government can continue to help displaced Puerto Ricans in Connecticut. Posted in New Britain Herald, General News, New Britain on Monday, 9 July 2018 21:09. Updated: Monday, 9 July 2018 21:12.